With a jaw-dropping 252 Vvs1 Clarity E-F Color Diamonds gracing the entirety of its length, this 18k white gold Cartier Love Bracelet is captivating to a degree which almost defies description. 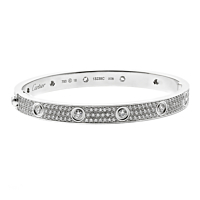 While Cartier's legendary Love Bracelets have been a jewelry industry sensation for decades, this top-tier model takes that iconic design to a whole new level thanks to its alluring abundance of diamonds and its sleek, flawless appearance. Love Bracelets don't get any more glorious than this!